In the light of World Mental Health Day (October 10) a meeting on the ‘Mental Health in Elite Sport’ will be held by the Intergroup Sports of the European Parliament. Registration : here by September 26 2018. 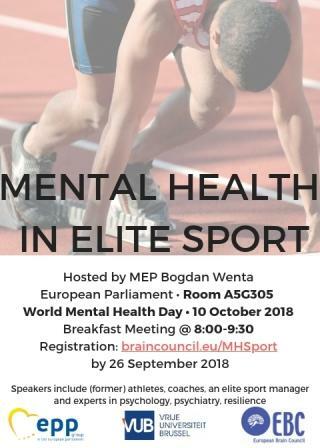 In light of the WHO’s ‘World Mental Health Day’ on Wednesday 10 October, a meeting on the ‘Mental Health in Elite Sport’ will be held by the Intergroup Sports of the European Parliament. This meeting aims not only at identifying the role of elite athletes and coaches’ mental wellbeing, but also to acknowledge the needs in providing professional mental health support services to those acting at the highest level of competitive sport.